Technology - EEBus Initiative e.V. 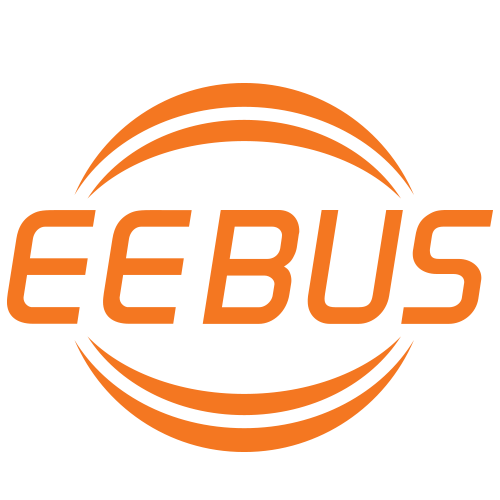 The primary objective of EEBUS is to define a universal, machine-readable and interoperable standard. For this reason, EEBUS technology is designed to harmonize with various protocols and transmission channels. Only through this consistent approach can different technologies merge to form a customer solution. 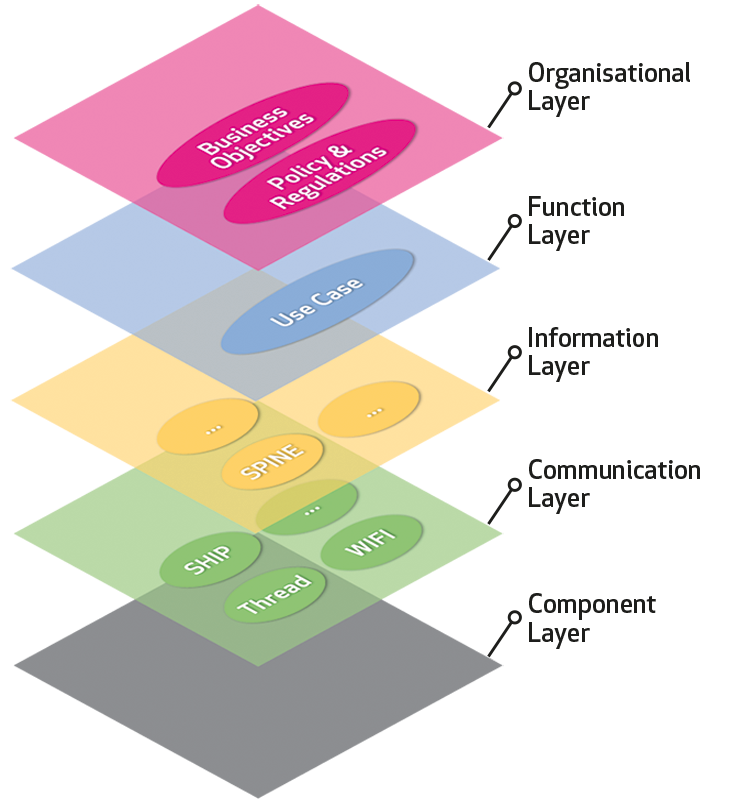 Clean architecture – a clear separation of layers. The following figure shows an overview of the layers and solutions used. 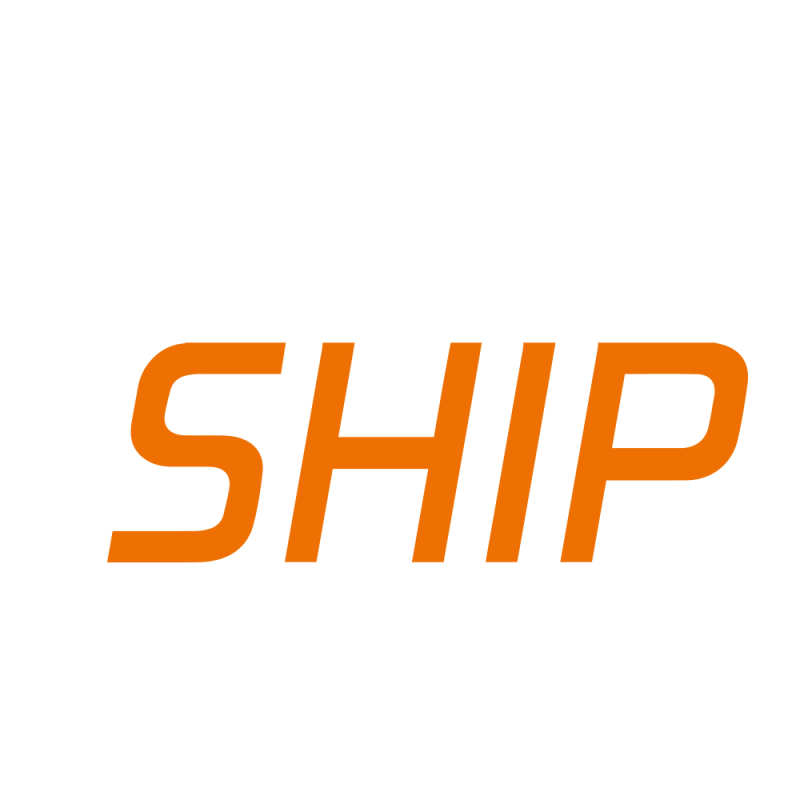 SHIP describes the standardized transport of data over IP. 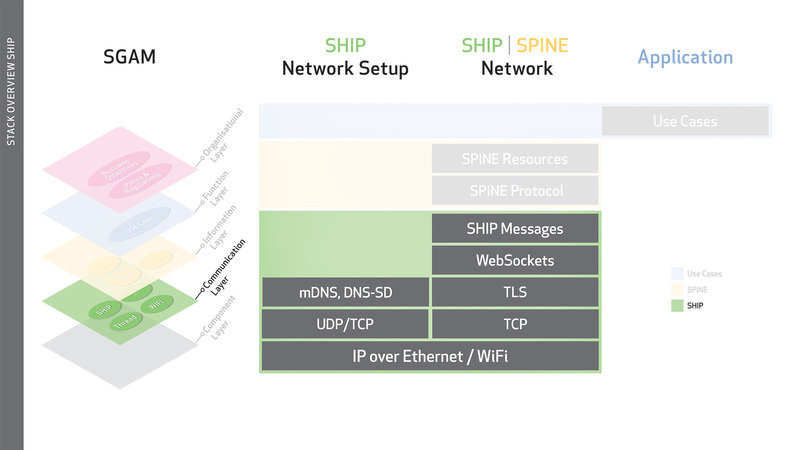 In addition, SHIP provides mechanisms for setting up a secure network. 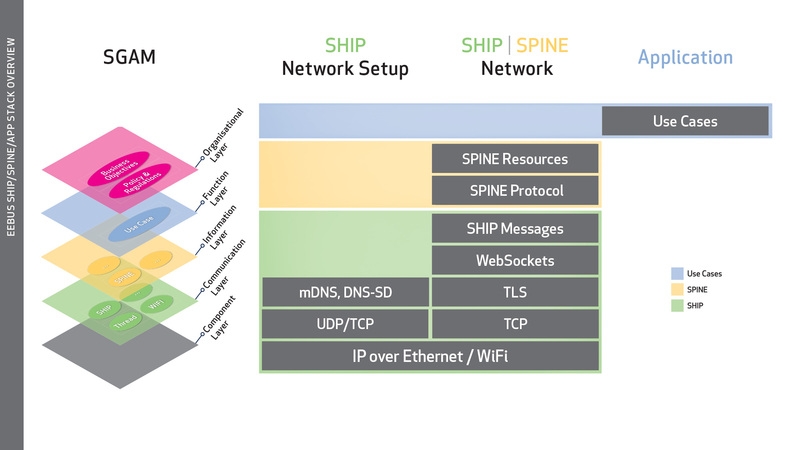 A SHIP device can communicate with any SHIP device within the same network. SPINE is a toolbox of modular elements to enable the realization of any use case today and in the future. The toolbox contains a collection of data classes that can be exchanged on various technological platforms, communication and transmission channels. 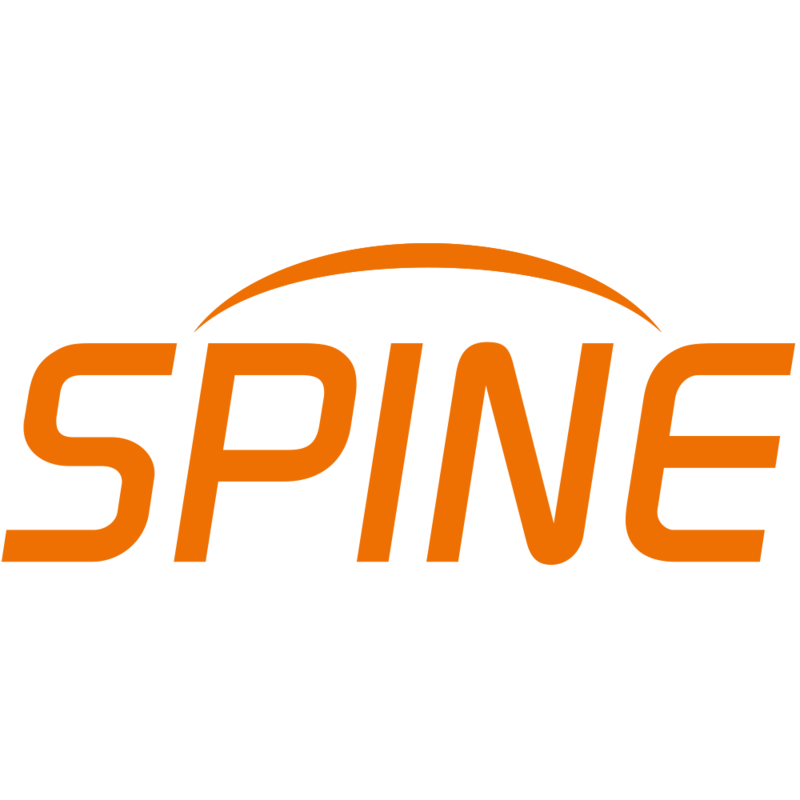 The SPINE resources describe the device model and the message content itself as data models (class descriptions) and application rules. 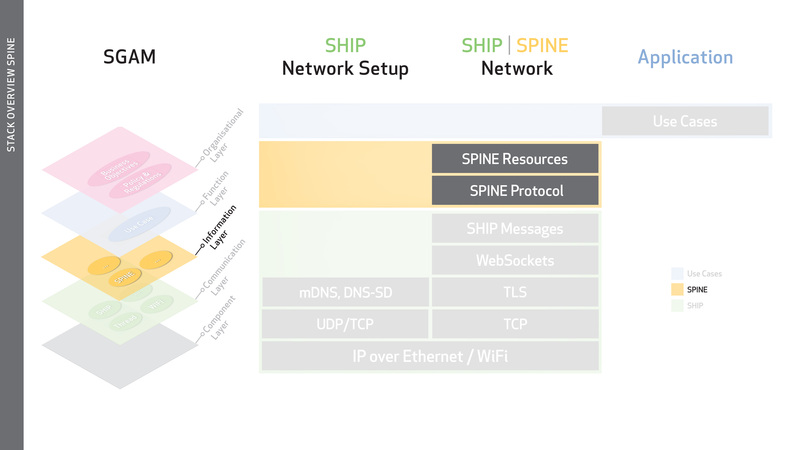 The SPINE protocol describes the format of a SPINE datagram as well as rules and descriptions for connecting SPINE devices such as identification of supported use cases or determination of the address of a function. The respective application completes the EEBUS communication stack with the use case. 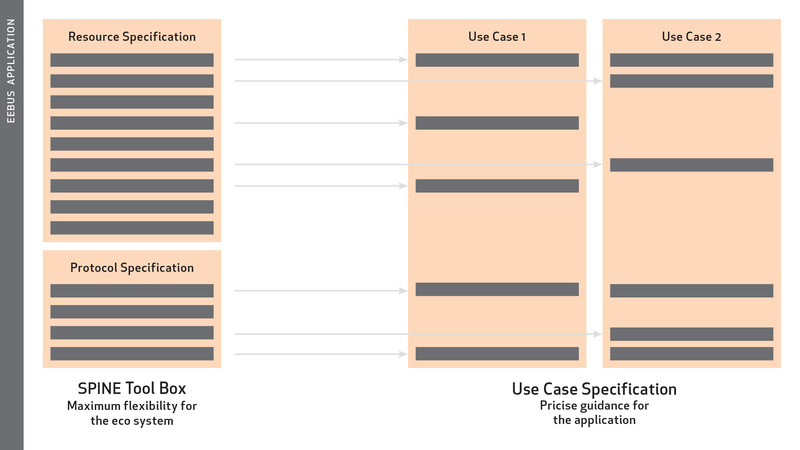 Our use case specifications are “manuals” on how to use the modular and universal SPINE toolbox to implement a concrete solution with a tailored customer benefit. In this way, EEBUS provides an interoperable and expandable, but at the same time backward compatible, interface. Which EEBUS use cases a device supports can be queried via a “Use Case Discovery” from any device in the EEBUS network. New use cases can be uploaded via device update and found accordingly. The following use cases are available or under development. The EEBUS specifications are available free of charge and can be used without any license costs. Our use case portfolio is continuously extended by our member companies. Use cases under development will only be included in our documentation after successful system validation through a plugfest. Please note that we can only provide so-called snapshot versions to our members to support their product development process. EEBUS spezifiziert mit Hilfe der SHIP, SPINE und Use Case Spezifikationen die Sprache der Energie. Über ihre Software- Produkte zur EEBUS Integration ermöglichen Bosch Software Innovations und KEO Connectivity eine einfache Umsetzung der EEBUS Schnittstelle. 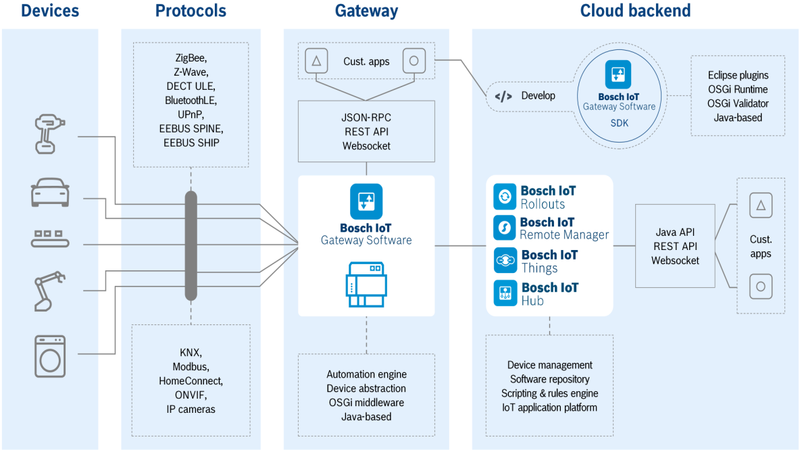 Bosch IoT Gateway Software is a platform-independent, edge-computing middleware that has already been deployed on more than 40 types of gateway devices. Its rich set of open APIs and development tools makes it easy to develop and operate local applications on the gateway, providing autonomy and intelligence at the edge – even without an internet connection. Bosch IoT Gateway Software is based on Java and the OSGi modular framework, which enables software to be installed and updated on the fly. Bosch IoT Gateway Software provides out-of-the-box support for most connectivity protocols, including EEBUS SHIP incl. the EEBUS SPINE data model. KEO GmbH is specialized in services that cover all important aspects in the world of EEBUS. 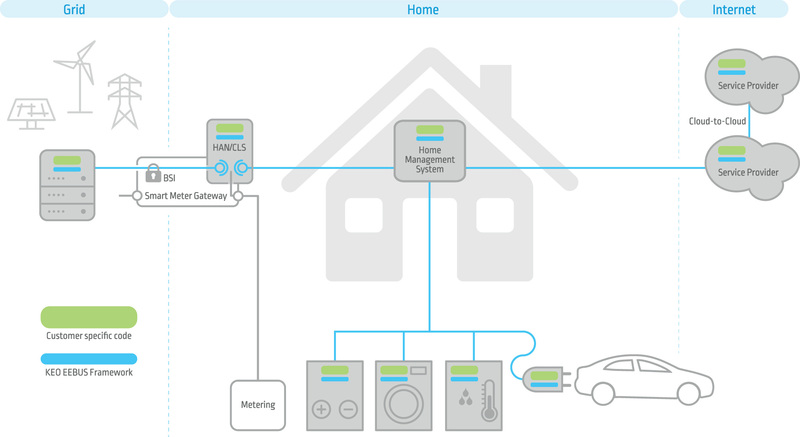 With our series-proven EEBUS software stacks, we connect energy-relevant devices from all industries with energy management and the building with the grid. Our solution portfolio includes EEBUS solutions from the RTOS stack developed for the automotive industry to various LINUX solutions to the cloud area. The standard-compliant and optimized APIs offer very easy access to SPINE data classes as well as to preconfigured EEBUS use cases. In addition, we offer validation and test soft equipment for EEBUS implementations.